If you were getting weird results from the webpage earlier today, it was the growing pains of moving radio.macinmind.com to secure https from http. I didn't do this for years because I didn't think it was important for a site like this with no login but the browsers are now making the fact that it is "not secure" more and more prominent. Supposedly search rankings are lower for non-secure sites. But I also read that https can be considerably faster so all those things combined was enough impetus. Even though streams can also be secure now, I see absolutely no need for it. Over the past 2 years, more than 8,000 shows are new or upgraded. About 1,000 of those are from reels I've digitized. Philo Vance got upgraded with replacements or additions taking us from 59 to 85 episodes. Every episode got individual cleanup attention. Now with the excellent audio quality, these sometimes fun dectective stories are much more enjoyable if you can make it past the shrill organ music. Gunsmoke got 143 upgrades and 52 additions making a total of 329 of which 307 were edited for time, noise reduction and general audio quality. The vast majority of these are excellent audio quality but I stretched it a little bit to try to include the greatest number of episodes. Where there are repeats, I only included them if the audio quality was as good or better. But quite a few had to be excluded because they run under 20 minutes. Start listening to any Gunsmoke episode and you'll be captivated, even if you don't think you like Westerns. Many listeners have expressed that this is the only Western they want to hear. The first of this upgraded collection plays Sunday at 8AM and 5PM. Lux Radio Theatre just got 188 additions or upgrades, a few removals, and a lot of time corrections, edits and noise reduction to both the incoming upgrades and the existing giving us 376 good playable episodes after about 60 hours of work. The last time I audited this collection was probably 10 years ago. Even with that amount of work and having opened many of these audio files, it's still possible there might be some odd audio I missed but I know it is far better than it was. I also added the featured stars in the titles for the whole collection. Lux Radio Theatre often remakes Hollywood movies for radio using the original stars when they are available. Its pace is different from so much of the rest of OTR due to the use of an hour to tell the story. You might hear something here you like and decide to go find the original motion picture later. Added 54 episodes of a new program to Mystery/Thriller, The Chase. The first one airs midnight Feb 15. 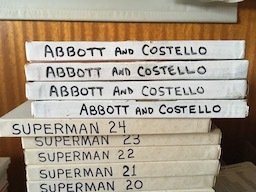 Did a full audit of Abbott and Costello. We went from 80 to 120 episodes with 96 replacements or additions, 36 of which came from the ABN reels. All of these skits are as good if not better than the famous "Who's on First?". The only critism of this show is the contrived laughter at the beginning in the earlier years. In one episode I can hear someone say something like "Remember to give a really hearty laugh". The audience is compelled to give fake laughter to start the show. But the whole shows are really good humor with a lot of word play, a bit of impovisation from the script, and dialogue that is sometimes suggestive but with a lot of class. Once I'm done with Superman, two big upcoming projects are Hallmark Playhouse and Challenge of the Yukon. With Challenge of the Yukon, my original collection from a regular OTR dealer has a lot of mp3 hiccups so I haven't played it in years. I've already digitized 12 reels of this but need to do the work of making mp3 episodes out of it. 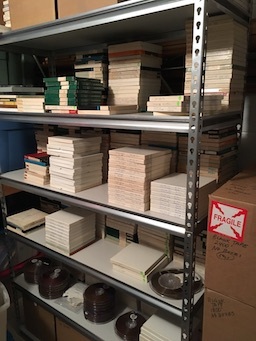 With Hallmark Playhouse I have 2 collections to merge, one of which being from 13 reels which still need to be digitized. Both will be big new additions. Added 64 Space Patrol to Science Fiction for a total of 96 episodes with many upgrades. Added 39 Academy Award Theater as a new program to Matinee Theater. Added 102 Have Gun, Will Travel as a new program to Frontier Stories. Added 8 Macbre as a new program to Mystery/Thriller. 520 Superman are now done from reels. So far I have digitized and prepared about 400 Superman episodes from the reels. It's amazing how much better these are than what's in general circulation, not all, but a whole lot. I also did a full audit of Ozzie and Harriet adding 21 from reels 12 from other new sources. But the total number of episodes went down after this audit due to having to remove many poor quality episodes. This is one tough program to find. Burns and Allen is another I'm struggling with. Apparently not many of these two comedies survived. No support anwhere could figure this out. But I figured out why the Amazon Kindle Fire, at least the 5th Gen Fire OS 5.3.6.4 (626533320), will not play the station in any app including Silk and TuneIn. Apparently the Kindle Fire OS is blocking port 8000. I've notified Amazon and I'm looking for a workaround. It's not reasonable to change ports and go through the whole process of re-advertising a new server address again. That was weeks of work. Amazon needs to fix this. As you can imagine, even when I figure it out for them, I must jump through all the hoops of support to report it which took about 3 hours. Maybe... just maybe, something will happen. 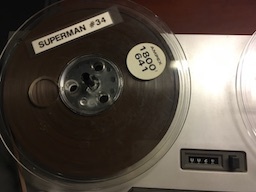 I've begun digitizing 45 Superman reels with 24-28 episodes each and the results are most episodes are terrific quality improvements. I started with episodes at the position we are broadcasting in this serial and I'm working my way forward and then around. That means you will only hear the best available with the reels included when they are better. So far I have over 10% of all Superman upgraded. I will end the old server in less than a week. I don't know what else I can do to get the last 25-30% moved over. I've been running audio announcements and notified all directories I can. I most recently notified vTuner and they are now moved over although they insist on keeping the AM 1710 art of years ago even after I provided them new art. Some directories have had trouble understanding my concise English that I'm replacing and not adding a server so it's been a lot of work getting them to do it right. And although I found a form to try to submit the new server address to Apple's iTunes "Internet Radio" directory, they still write back that they don't allow any modifications so I suppose they'll just leave an old AM 1710 in their directory that won't work. Nothing I can do for that. That's the level of quality they insist on. iTunes users just add it yourself--File menu, Open Stream, http://radio.macinmind.com/listen.m3u and put it in a playlist to find easily. Nov 22: Everything should be resolved. AT&T did maintenance, I replaced the router, and a new streaming server was added. The audio source programming is still the old Mac mini from 2010 which continues to work perfectly. The old streaming server will be discontinued very soon. Everywhere I have control I've updated all references to point to the new server and advised all directories that I can find of the new address. This includes the web player, mobile, TuneIn, onlineradiobox, Streema (simple radio), Grace Digital, and icecast's own directory. I can't update the listing in iTunes directory because Apple won't allow it so you'll need to manually add the address to iTunes (File menu-Open Stream) or anywhere else it has been manually entered. http://radio.macinmind.com/listen.m3u will always point too the right place. New streaming service is less expensive so expenses next year will be less than this year. Nov 18: Added new server and set web player, mobile, and links on pages to point to this new server. Mobile page may need a reload. Nov 16: Resetting everything with the connection at 6PM. Nov 15: There have been interruptions to the internet connection several times per day for the past week. Some are short enough to not be noticeable but many are disconnecting everyone now. AT&T is visiting today. Switched to backup network until resolved, hopefully later today. Replaced a couple dozen Mysterious Traveler. Did a full audit to The Aldrich Family adding many. Added The Anderson Family (not to be confused with Father Knows Best). And replaced a few other miscellaneous. I slowed my pace on the reels but will get back to it during the winter. 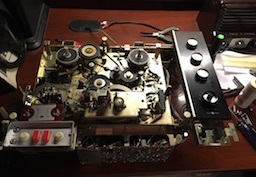 The TEAC 4070G reel-to-reel I picked-up at hamfest is mostly restored but still needs an alignment and speed adjustment. Using 14 reels got 122 additions or replacements with 38 from other sources taking us from 59 to 160 episodes of Let George Do It. Only 3 episodes didn't get replaced. The main reason for such a large amount of replacement is because the most common mp3s of this in circulation were done I think in 1999 and 2000 and they were encoded poorly with hiccups or audio drops every few seconds. Being that I'm one of the few to go back to analog to retrieve this, at minimum we got the same fidelity without glitches but mostly exceeded it when you look at how many new airable we got out of that. Also, using 9 reels got 8 replacements and 16 new to Broadway Is My Beat and using 8 reels got 47 replacements and 12 new for This Is Your FBI. I will begin indicating which shows are taken from these reels with either a tiny reel icon or this: o_o = from ABN reels. What an experience to get material that's been all analog up to me. There's a lot on reels that is poor or unusuable, but it's worth it for that fraction that gives us sometimes very uncommon quality. I've digitized 57 reels so far--45 from the Ohio collection which is just over 2% of it. Made very significant improvements to X Minus One, getting 18 upgrades from the reels and other upgrades from other sources for 129 playable. The Life of Riley got a full merge/audit with 83 upgrades or new from reels, 18 from other sources for 195 playable. Father Knows Best got 26 upgrades or new from reels and many others from other sources for 105 playable. 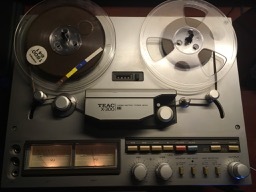 After fighting with issues with the 50 year-old Sony Deck and not being able to get the AKAI to run at all yet, I decided to purchase a fully-serviced reel deck from the 80's--a TEAC X-300. These fully-serivced decks can be very expensive but since I can do without pro features and auto-reverse, I did okay with this. In side-by-side recording tests against the Sony, the speed is more correct on the TEAC and the background hiss is less. And it runs nearly silently on my desk beside me. I knew I had to do this in order to get through this mass number of reels. I've included the cost of this in the amount needed for 2018. X Minus One will have a 3-source merge and audit completed shortly. This was one of the first programs I collected before I started the station publicly. In my memory I thought I had good quality at the time after merging some collections but today there's better and it needs some attention. One of the sources is the reel collection but I don't know yet if any of those will win. So far they sound just as good as other good sources so we'll see. Performed an audit/merge on Philip Marlowe replacing nearly half the episodes with upgraded audio. From here on, the two collections will be known as the Ohio collection and the Illinois collection. I have about 600 of 6,000 of the Illinois collection and I have all 2,000 of the Ohio collection. The nice thing about the Ohio collection is that it is very well cataloged. I can lookup a show I'm interested in to get the reel numbers and then head into the archive room to pull the reels for digitization. Over the past few days I've replaced Whistler episodes using the Ohio collection where audio fidelity is better at the expense of more noise. I think the added noise is okay considering the presence of the audio improves and my technique for noise reduction is moderate and not distracting. So far I've upgraded 30 and added 2 episodes that were previously too poor to air. 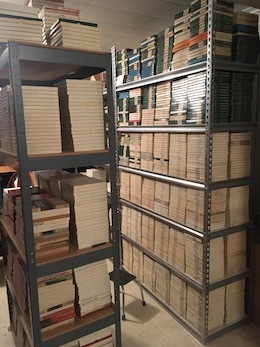 Below are the 2 shelving units with the entire Ohio collection. 20 hours, 1,000 miles, 40 x 1.5 cu ft. boxes, 1,500 lbs, 2,000 reels. It was a long day yesterday but I've secured a well-cataloged reel collection from 30 years of collecting in good condition as well as an AKAI 1722W reel deck. 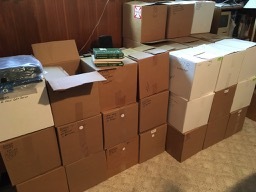 Just purchased 4 large storage shelves for physically storing and 2 5TB drives for digitally storing the incoming reels. Each reel occupies (a convenient for calculations) 1GB when recorded in Apple Lossless. 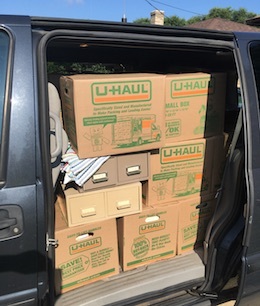 I was thinking I'd have to rent a storage unit for this volume but we managed to do some cleaning, reorganizing and purging things we don't need to make room. 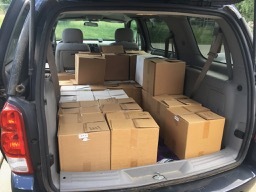 The number of reels expected over the next year is still unknown but could be as high as 6,000 now and perhaps higher if I go after another reel collection that is also available but much farther away. 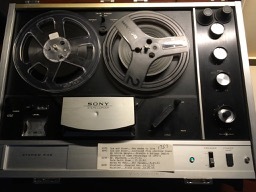 I will surely need to get another and a better reel deck than the Sony TC-530 I have. I've already done a minor overhaul to this deck and had to deal with sticky tape syndrom cleanup. I don't count reel decks as an expense yet because there's a chance some of this will be gifted to me or at least I'll get it a low cost. New and upgraded audio will trickle into the broadcast library and may not always be worthy of mention here. Just acquired about 1,800 reels of which 600 are OTR out of over 3,000 5,000 OTR reels potentially to be acquired this year. I've already digitized a few reels and added or replaced episodes in The Line-Up, Hall of Fantasy, The Clock and This is Your FBI. It will be a mining expedition to find where the reels add to the collection or surpass the quality of what we already have. I'm sure only a minority of it will be upgrades. 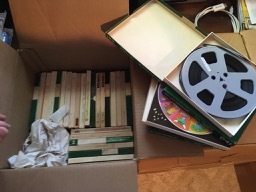 Collectors typically put 12 (30 min) episodes on each reel using one program on the left and one on the right for stereo tape. So I can digitize them at a minimum of 2x speed. If you'd like to purchase used blank Ampex 1800' or 2400' 7" reels for cheap (no boxes), let me know. With the help of station friend Ryan's contribution of episodes, I did a thorough audit of Gang Busters giving us a total of 68 episodes with audio good enough for airing. Gang Busters had a very long run from 1935 to 1957 with probably over 1,000 episodes that originally aired. It started on NBC, went to ABC when that was formed out of NBC Blue and then later was on CBS and finally on Mutual. Unfortunately very few recordings are available or in the public domain that I can find. Gang Busters entered into English slang "to go on as Gang Busters" due to the loud opening of the show. It's open cases announcements with "be on the lookout for" may have brought as many as 286 criminals to justice in one year and were later imitated in the 1990's by Unsolved Mysteries on TV. The world keeps moving and although we can stay in one epoch for radio, we can't do the same for the internet and web. I had to remove the antique radio gallery due to the gallery software not being updated since 2013 making it incompatible with the version of php I must move to. I also removed Twitter but replaced it with this journal on the mobile version which I think makes the mobile better. Jack Benny is done from 1938-1955 giving us 495 playable episodes. That's as far back as makes sense to go from what I've been able to listen to. 148 episodes of Life with Luigi was added and more than 100 other audio upgrades were done to several other shows in the past month. All in all there have been 4,000 shows upgraded or added in the past year. Jack Benny is done for 1943-1955 so far with 365 airable episodes. I've done audio work to 95%. In a set of two episodes I was comparing where Jack and the gang are on a train, one file has noise reduction done already which made it sound pretty clean and the other didn't. But on further comparison, I discovered the noise reduction had actually removed the intended train background sound effect. So I obviously used the other and did my own noise reduction. It has to be done carefully. For example, you don't want to remove the subtler sound of phone ringing as heard over the line from the caller side. In the process of doing a complete audit and upgrade on Jack Benny. Working my way backwards, I now have 203 episodes done for the CBS years 1949-1955. This is a really good audio quality upgrade but it is taking some time as I'm having to do audio restoration work to almost every single episode. Just added 91 episodes of Tales of the Texas Rangers to Police Stories. First episodes will be heard Sunday. At first blush you'd think this would be a western and fit in Frontier Stories but it is set in contemporary (OTR) times and more or less resembles a Texas version of Dragnet. Just completed a 5 source merge quality improvement on Our Miss Brooks giving us 124 episodes we can play. Also just completed a 3 source merge full replacement of Night Beat giving us 69 episodes. Thought I was done with the Lone Ranger but I was not. Did another infusion bringing the total up to 1,828, which happens to be the year Rossini began composing the Lone Ranger's theme song (aka The William Tell Overture). I quality reviewed a lot of audio over many days and 10's of hours. I adjusted a lot of audio removing leading and trailing silence, removing hum, and even notch filtering-out a 4,500Hz tone in some episodes among other things. I made good use of batch processing and 12 CPU cores on this project. Thanks to Bob Merritt of Conyers OTR for helping with this. The programs that are not The Lone Ranger in Frontier Stories make up 628 episodes and already with the 685 we had for the past 3 months, The Lone Ranger was getting heavy play to the dismay of some Lone Ranger haters who made sure I knew. I actually understand that as I didn't care much for it either. Even without the complaints I would have done this: I made it so The Lone Ranger only plays Monday, Wedenesday and Friday as it mostly originally aired and everything else plays the other days. Everyone should be happy. The Lone Ranger is actually a very good program and sometimes includes some history. It's a lot more enjoyable when we have good audio. BTW, I forgot to mention I added 27 episodes of Mr. Keen, Tracer of Lost Persons in December. Just noticed today that Jungle Jim is not rotating past the first two episodes. No one said anything. It will now start rotating beginning tonight. New serials schedule starts today. Different serials will run on different days. In addition to Superman 3 days a week (Mon, Wed, Fri), other days will be for Magic Island (Tues), Speed Gibson (Thurs), Jungle Jim (Sat), and Marco Polo (Sun). The Lone Ranger project is done with 685 airable episodes replacing the older 150. I've embarked on what will be the largest project for any program with the Lone Ranger. This program ran 3 times per week from 1933 to the mid-50's with over 3,000 total episodes. Recordings were only made or kept consistently starting in 1938. Before I started this we only had about 150 episodes approved to play and not all of them were good. Now I'm about halfway done and there are nearly 500 fixed and or approved episodes. I've properly titled, named, distilled the best of duplicates, and done something to nearly all of them in a couple different audio editors. I'll continue this as I find time and it is possible I will go to reels to do my own digitizing since so many mistakes I'm finding were made at the digital stage. Added the new Game Shows segment today starting with episodes from Information Please and The Quiz Kids. It airs 5:30 AM and 8 PM. I wanted to put it at 8:30 PM to match the time announcement Information Please often makes that it is 7:30 in New York but I'd have to swap it with Serials. The progression from Comedy Shows to Game Shows made more sense. Removed You Bet Your Life from Comedy but haven't placed it in Game Shows yet since I want to review it better for quality. Tens of hours went into preparing these game show episodes to have them properly dated and titled and to review many hundreds of audio files to find the best and then edit most of the best to make them better. To make room in the schedule I placed Science Fiction and Spy Stories in the same 30 minute slot daily. Science Fiction will be Tuesday, Thursday, Saturday and Spy Stories will be Sunday, Monday, Wednesday, Friday. Added 26 episodes of Stand By for Crime to Detective. This program was apparently done in 1953 but it has no exact dates and no sponsor. It could have been a sustained summer replacement but it's not entirely clear if it ever aired. It is good nonetheless. After what seems like a couple years, I've finally finished listening to all 461 Whistler episodes in order. I was doing this on a Sansa Clip as my bedtime listening to make sure I've heard every second of audio and certify it is good listening. In the process I made a few adjustments and fixes. I just updated the Antioch Rebroadcaster to version 1.0.7 which addresses issues mostly in the Windows version. ABN listener, Brian, has written a screenplay inspired by The Whistler episode that aired today, Stolen Murder. He's put together a speculation trailer and uses character names Elliott and Lewis as a nod to OTR. I added $100.00 to the needed this year which still keeps it well under last year. The reason is so I could upgrade audio tools to work with all of the raw material I have for additions and audio upgrades I will be doing this year. The tools have gotten much better than what I had. Just a couple weeks ago I did this with Boston Blackie and added 19 episodes and improved a few dozen other episodes. We reached the halfway point for funding the station for the year. A few weeks ago I helped with that by lowering expenses by bringing our maximum listeners down to 1,200 from 1,500. Only once ever did we exceed 1,200 and I looked at the peak in the past few months to determine the best maximum. When ionospheric conditions permit I try to get on with ORCATS (Old-time Radio Collectors And Traders Society) on 7.238MHz LSB Sundays at 7AM CT. ORCATS formed in the early 70's and has been meeting on the 40m amateur band since that time. The two founding members (Ken W9ZMR and Larry WA8DDN) are still running it. I first started with them in 2003. It can be a challenge to communicate with conditions that change week to week and minute to minute sometimes. We also compete with an AM broadcast station at 7.235 and also sometimes hams just 2KHz above us so a notch filter and passband filtering or other filtering is often required. I know that maybe as much as 20% of listeners are hams. You are welcome to participate or at least just check-in and say hello. 73 de KC9AYH. With a couple large donations by postal mail that came in today in addition to the several other donations of the past few days and weeks, we completed the funding for 2015 and moved into funding 2016. Wonderful. Today alone $542.00 was donated. Thank you for the full support this year. Happy New Year. We are rather far behind in funds donated this year compared to all other years. In previous years we were fully funded by December 15th. I prefer not to solicit over the air and certainly won't do that this year. New this year, I added a fundraising offer where you can get a discount offers app for your phone for $20 and donate $10 to ABN. This comes from a dedicated listener in Minnesota who wanted to help. For 2016, I'll look at cutting expenses and see if we can get a better rate. When I moved up to 1,500 allowed from 1,000 we got a much better rate so I'm not sure we'll save all that much by taking it back down to 1,200. But hopefully all of this bandwidth should cost less in 2016 than it did 10 years ago. To all of you who donated this year, thank you. Those small donations are the majority and they absolutely do make the difference. Thanks particularly to those who subscribed to monthly payments. In 2016 I will make some more moderate schedule changes and add a whole new segment. My idea is a grabbag segment that picks programs that don't fit into our current subgenres. I have a huge inventory of very good quality now. It just requires my time to review it. The Cinnamon Bear starts today at 3PM & 8:30PM and runs two episodes a day through the 24th. Last year was the first year I listened to the whole thing and even though it is a juvenile serial and sounds a bit hokey with the characters, it is actually quite good with some very creative original music. And Santa even has a ham station revealed near the end of the series. To help us finish off the year, we have a special offer. When you purchase a digital coupon book for $20.00, $10.00 goes to ABN. A card is postal mailed to you which you can scan with your smart phone to use an app that will give discount offers to you based on your location from now until the end of 2016. Visit the Support page for more information. Ended the poll question today. Out of 332 that responded Nov 17 - Dec 7, 64 said they were amateur radio operators. That's an incredible 19%. Pearl Harbor day, 74 years ago today. Just completed a behind-the-scenes update to the HTML & CSS to make it more modern. The Recent & Upcoming now has a tabbed interface and some other refinements. 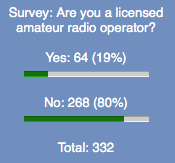 I also just added a poll question: Are you a licensed amateur radio operator? Just 0.2% of the U.S. population can answer "yes" to this question. But the reason I ask is because I've received what seems like an disproportionate number of emails from amateur radio operators. The site now has a mobile version that appears like a mobile app. Just use the web browsers such as Chrome or Safari on your smartphone to go to radio.macinmind.com. On Android you can save to your home screen for easy app-like access. The same can be done for iPhones but unfortunately when launching the site that way it doesn't play in the background whereas Android does. You should have player controls to play and pause on the lock screen. Also for Android users, you can request the desktop site if there's something there not in the mobile that you want to see. The nice part about providing the mobile app this way is there's no version for me to submit to various stores, no updating you need to do. Anything I improve is instantly upgraded for you. By the same token, anything I break will be instantly realized too. I have a few more things I'd like to do for the new mobile site but have a look at it now. In the past few weeks I've done upgrades and additions to Counterspy, Broadway is My Beat and added The Line-up. Before that, at the end of May I released the Antioch OTR mobile apps for iOS and Android. Changed the frequency to 1610 KHz so I make no particular claims about getting around town as this frequency is competing with many stations day and night. I moved it to 1610 because I've only ever heard signal reports from amateur radio operators nearby but never from anyone else over the course of 11 years. I hear the kids now don't even know what AM radio is. Also the rules are easier in the true AM broadcast band and my current objective with the terrestrial side of the station is to go back to my original idea of giving content to the antique radios in the house and power the bedside crystal radios. Since the frequency is no longer a big part of the station, I've slowly removed references to AM 1710 and now ID as "Old-Time Radio Antioch". I released a new version 1.0.4 of the OS X dashboard widget. I'm not sure how much dashboard widgets are used but the new version has some fixes and an updated icon. I'm considering some small schedule changes after over 5 years since the last change. It will not be very major but it will allow some of the long-time listeners a bit of rotation on the types of shows they hear. There's more in the works but you'll have to wait for that. I'm really late with this kind of feature but I just made it so the main page now dynamically updates without a browser refresh. Classical music was indeed played often in the early days of radio so their use on AM 1710 is not so out-of-place. See here. We'll be running Christmas Serials beginning today @ 3:30PM & 8PM to run through December 24th. Added 211 Escape episodes to Mystery/Thriller this past week. I'll be running the advent/Chrismas series The Cinammon Bear playing two episodes a day starting in mid-December to culminate in the ending near Christmas. Just completed 108 audio upgrades to The Whistler while also adding 21 new episodes.